Halloween is coming and we are all getting dressed up! Halloween is the time of parties and trick or treating. The witches and wizards and zombies and ghosts all come out and wander our streets asking for sweets and chocolate! 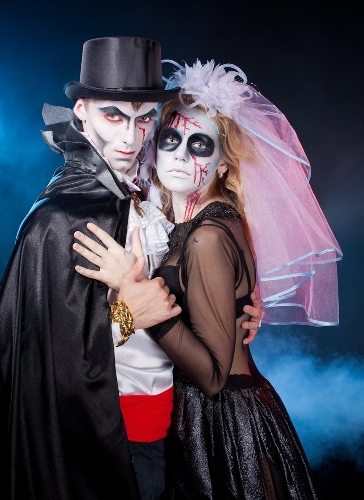 Halloween is a time that encourages people, kids and adults alike, to dress up and act silly. At Halloween, people may do things they wouldn’t normally do. Well, would you dress up as a zombie and walk round the streets mumbling “aarrrghh” and scaring people normally? In the past, it was thought that if you disguised yourself on All Hallow’s Eve, the Grim Reaper would be confused and pass you by. But why do we still think it is okay to dress up at Halloween? Well, Halloween is the perfect time for deindividuation. Deindividuation occurs when people lose their own sense of individuality when there are in a group or anonymous situation. This can result in antisocial behaviours. Diener et al (1976) argued that Halloween is the perfect environment for deindividuation. People may be wearing masks or costumes (so they are anonymous). They will be in a group (which can encourage deindividuation). And these factors can influence their willingness to behave in ways they wouldn’t normally – the “trick” aspect of Halloween – throwing eggs at front doors, scaring people and so on. There are other reasons we like to dress up at Halloween. Disguising ourselves allows us to behave in ways that we wouldn’t normally, and it can be quite exciting to hide who you are. But it can also cause discomfort for the people we encounter. Wearing a costume helps us to be imaginative and also to express ourselves in a way we wouldn’t normally; the shy person becomes the exhibitionist. It allows our hidden side to come out. Wearing a flashy costume allows a person to be different from normal. We get to be the “baddie” for just one night. Some people do argue that wearing Halloween costumes and masks are too scary for children (and some adults) and should not be encouraged. But as we saw in the previous blog, being scared when we know there is no risk of harm can be good for us. Norbert Elias argues that as our society becomes more and more structured and controlled, people are less able to express themselves emotionally as they need to. His view is that we have lost the places we could blow off steam and experience fear and adrenaline. He argues that we have thereby created places where we can do this without the risk of real death. Elias calls this the “controlled decontrolling” of emotions. : we might shout battle cries at a football match, or hoot at a concert–It is a time to act out and act up. Halloween is another one of those places, where we can act in a more primal way and experience the thrill of being scared and perhaps scaring others. So take care when you choose your Halloween costume this year! Make sure the Grim Reaper doesn’t recognise you and remember you are showing the “other side” of your personality that you keep hidden! !